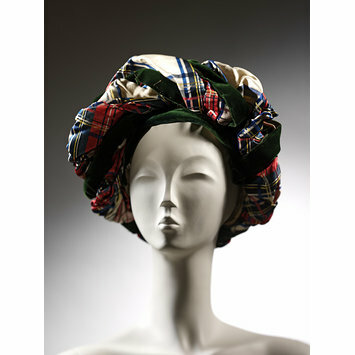 This turban is constructed of a plaid weave silk wound around and interspersed with velvet bands. As with many fashionable turban hats of this period, the fabric is pinned into place rather than being stitched. This would enable the hat to be easily reconstructed if so desired and would avoid marking an expensive silk fabric. The turban was a popular form of fashionable headdress from the 1790s until 1820s. Inspired by interest in the classical world and exotic ideas of the East, the form and style of fashionable turban changed frequently. 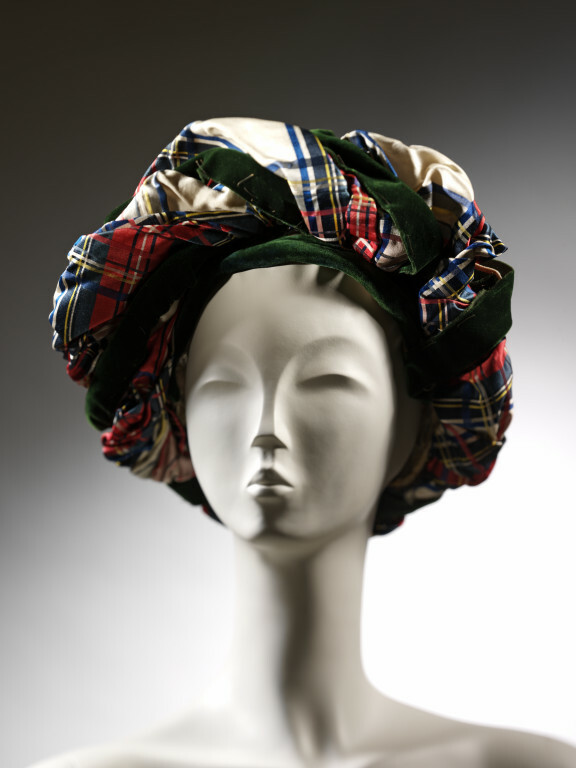 This tartan turban, with its emphasised front and velvet banding is typical of styles of the mid-1820s. Traditional Scottish dress and tartan in particular, had been popularised in the late eighteenth century by the Prince of Wales, later George IV. Tartan appears frequently in fashion plates of the first two decades of the nineteenth century, mostly in the form of accessories, such as shawls, ribbon belts or turban style hats such as this. Tartan silk turban, probably a dinner or theatre hat, white ground silk with vibrant coloured plaid stripes in blues, greens, yellow, reds and crimson. Front edges bound with green silk velvet. White-ground tartan silk turban with green velvet ribbon, Great Britain, 1820-35.